Some images from our recent Bahamas sailing adventure are now on sale at Getty Images. These are a few of my very favorite photographs from the trip. Over the next few posts I thought I’d share just a little bit of the story behind each one. Like many photographers, I am in love with lighthouses and I gravitate to them wherever I go. This one, however, has a special place in my heart and my collection. It happens to be the last of a dying breed. It’s one of the remaining two or three lighthouses in the world that is actually still lit every night. I hadn’t realized that there were so few. Most lighthouses have now been automated. This one is still fueled with kerosene. It’s located in Hopetown, one of the most picturesque of the little settlements scattered throughout the Abacos. One day in April we sailed from Marsh Harbour to Elbow Cay for a visit. It was a stunning day and we had a beautiful sail. We grabbed a mooring ball in the Hopetown Harbour and spent the next few days touring this fabulous cay and its pretty little settlement. I fell hard for this lovely place and its laid back friendly foks. I can’t wait to go back again. One of the highlights of our stay was climbing the 101 steps to the top of this lighthouse. It wasbuilt in 1862 and became operational two years later. Its light can be seen from 23 nautical miles (43 km) away. It is maintained by a family of lighthouse keepers that goes back many generations. It has a spring mechanism that has to be hand cranked every several hours to maintain the sequence of five white flashes every 15 seconds. The lamp burns kerosene oil with a wick and mantle. The light is then focused as it passes through the optics of a first order Fresnel lens that floats on a bed of mercury. I took this picture from the top. When you look down from the lighthouse, you can see the Hopetown Harbour with its many boat visitors tied to moorings. The strip of land behind it is the little settlement of Hopetown. Neither cars nor golf carts are allowed in the town but you can travel throughout the rest of the cay using golf carts. 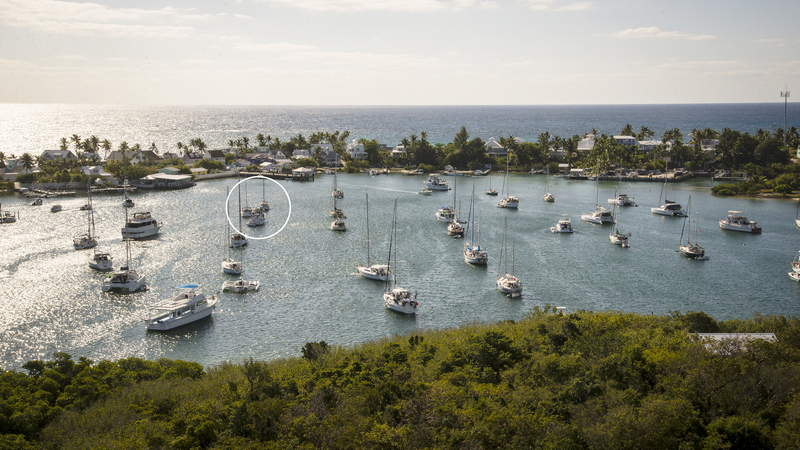 Our sailboat, Windsong II, and that of our buddy Mike, the Casey Dee are circled. It was just a short dinghy ride from the boats to the settlement.The water visible behind that is the sea of Abaco and there is a gorgeous beach that lies along that shore. While there, we had another of those “small world” experiences that make you slap your head in surprise. One day a fellow sailor going by in his dinghy happened to see that we were from Ottawa. In that neighbourly way that cruisers have, he stopped to invite us over to his boat for drinks that night. We went and had a great time exchanging stories and learning about their experience living eight months of the year in the harbour on their sailboat. But the funniest part? Not only did they live in Ottawa during the summer, but they lived right around the corner from our old house — and in the 17 years we lived in Ottawa we had gone by their house hundreds of times while walking our dogs. They were former neighbours! Beautiful place. I love lighthouses, too. I bet you’ve seen quite a few. I love the story behind the photo! And I love lighthouses. We visit them whenever we come across them, the latest being in Baltimore a couple of weeks ago. And that is an amazing story about your ‘neighbor’! Beautiful photos, but I really love that coincidence story, too! Kerosene and hand-cranked light, still operational…amazing! Nice photos – love that view of the harbour. Congrats on the new Getty images! fun to relive your adventure in this beautiful place, how fun to met up with a neighbor. Your photos are always awesome. I especially love the lighthouse.